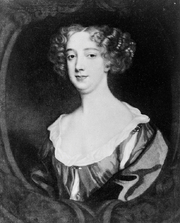 Aphra Behn was one of the first English women to make a living as a writer. She was a popular and prolific Restoration playwright and poet (her pen name was Astrea). She also worked as a spy for King Charles II. Virginia Woolf wrote, "All women together ought to let flowers fall upon the tomb of Aphra Behn, which is, most scandalously but rather appropriately, in Westminster Abbey, for it was she who earned them the right to speak their minds. It is she -- shady and amorous as she was -- who makes it not quite fantastic for me to say to you tonight: Earn five hundred a year by your wits." Not many facts are known about her personal life. She was born Aphra Johnson, and probably lived in Surinam in 1663-64. She may have married a Mr. Behn in 1664, though some have suggested she took a married name for greater propriety and protection. From 1666-67, she served King Charles II as a spy in Antwerp, incurring debts in her work which went unpaid -- Charles II was notoriously slow in paying bills -- and then served a stint in debtors' prison. Her first performed play was The Forc'd Marriage (1670), a popular and financial success. Many other successful plays followed. In 1688, Aphra Behn published Oroonoko, a short novel about a noble slave and his tragic love. It was an instant success, going through many reprints, and may be her best-known work today. At her death in 1689, she was buried in the cloisters of Westminster Abbey, where her stone still rests at Poets' Corner. Aphra Behn is currently considered a "single author." If one or more works are by a distinct, homonymous authors, go ahead and split the author. Aphra Behn is composed of 9 names. You can examine and separate out names.